Good morning! Welcome to The Morning Shift, your roundup of the auto news you crave, all in one place every weekday morning. Here are the important stories you need to know while we all slowly choke on our deteriorating air quality thanks to these dirty diesels. The German government has been all over Daimler, Mercedes-Benz’s parent company, for months investigating potential diesel cheating. And what do you know, Reuters reports that the manufacturer now says it’ll invest $255 million to “update” more than three million of its diesel cars in Europe. The big diesel-cheating scandal, Dieselgate, started with Volkswagen back in September of 2015 and really hasn’t stopped since. These days, it’s easier to name off companies that haven’t been caught cheating than the ones that have. “The company is investing about 220 million euros. 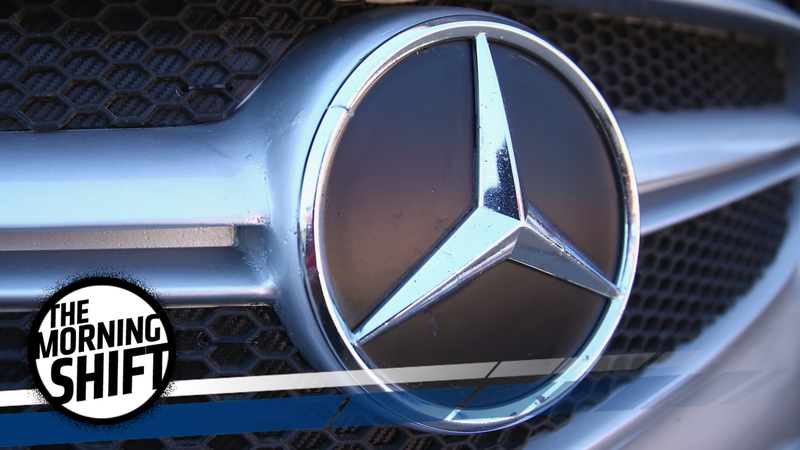 The service actions involve no costs for the customers,” Daimler said in a statement on Tuesday, adding that the updates would commence in the coming weeks. More than 100 million Takata airbags had to be recalled worldwide due to cheap airbag inflators that have led to at least 17 known deaths. The company filed for bankruptcy in late June, and was bought by Michigan-based Key Safety Systems for $1.6 billion. But the whole ordeal isn’t over yet, no way. Just last week, there were another 2.7 million recalled Takata airbags, but this time around, they were ones that had already been “fixed.” That’s not good. The recall wasn’t a “pull everything out and put new stuff in” type of thing. Instead, Reuters reports that Takata just produced 100 million new inflators with a drying agent to help keep moisture, one of the things that made the airbags explode and spew shrapnel, from hanging around. New testing by the National Highway Traffic Safety Administration prompted the recent round of recalls on already-recalled airbags, and it sounds like they’ll be testing others, too. Takata is the only global air bag maker to use ammonium nitrate as a propellant in its inflators. The compound’s vulnerability to high temperature and moisture can trigger an explosion that can spew shrapnel inside a vehicle. If additional airbags need replacing, Reuters reports that automakers could be responsible for replacements due to a lack of Takata funding. Chinese-backed startup electric-car maker Faraday Future has about as many problems as it does overly ambitious goals. Just over a week ago, the company stopped construction of its $1 billion factory in Nevada due to ongoing money troubles. But either Faraday Future’s new hires actually do not read the news, ever, or they know something we don’t know. Bloomberg reports that the company just picked up the former head of the BMW i electric-car division, Ulrich Kranz, who left the manufacturer after 30 years of working there. Referring to Faraday as a risk at this stage might be an understatement. The company last week shelved a $1 billion factory in Nevada, after months of state officials raising doubts about Jia’s financial backing. After Jia made a fortune building Leshi Internet Information & Technology Corp. into China’s Netflix, expensive forays into movies, smartphones and multiple automotive startups spurred a cash crunch and led a Chinese court to freeze billions of dollars in assets he controlled. Best of luck to you with all of those risks, dude. Hopefully your personal savings accounts are stocked up—you know, just in case. With new technology comes new rules, but in the realm of self-driving cars, we’ve mostly been focusing on how they’ll be governed on roads. But advocates for an estimated 1.3 million legally blind people in the U.S. are lobbying Congress both to help hurry this autonomous revolution up, and to look at all of the rules surrounding a driver’s license. Florida, Michigan and New York already have laws that require operators of automated vehicles to have a driver’s license, which mandates a vision test. What’s more, even states lacking statutes with such requirements would likely defer to current law, creating a de facto driver’s license requirement, according to Amanda Essex, transportation policy specialist at the National Conference of State Legislatures. Bloomberg has an extensive and fascinating report on it all, which you can read here if you’d like. There’s another self-driving car startup in Silicon Valley called Nauto and a bunch of big-time companies are throwing money at it. Who would’ve thought? Reuters reports that General Motors was the most recent to join in with tossing this new startup cash, giving it an undisclosed amount. Nauto is just two years old, according to Reuters. The startup said Tuesday that it just finished a funding round that raised $159 million, with Reuters reporting that GM, BMW, Toyota, Japanese internet and telecommunications company Softbank, venture-capital firm Greylock Partners and German insurance company Allianz all joining in on the hype. While GM did say how much it invested, Reuters reports that the manufacturer bought Silicon Valley autonomous-driving startup Cruise Automation early last year for more than $500 million. And while there’s a lot of money being thrown at these companies, it doesn’t feel like things are getting far—after all, a U.S. House subcommittee plans to vote on a proposal Wednesday that would let up to 100,000 self-driving cars that don’t meet current auto safety standards. The proposal would also keep states from enforcing their own rules about self-driving cars. If you think you have it bad on the New York City subway system, you don’t. If you think the subway is at all warm when you step onto the platform, it isn’t—not comparatively, at least. Before July 19, 1967, those misery-mobiles had no air conditioning at all. Gothamist cites the Metropolitan Transportation Authority as saying it took two decades of work to “produce air-conditioning units small enough to fit IRT cars and powerful enough to handle a large number of customers traveling during rush hours,” and the first subway cars to get air conditioning were on the F line. Anyway, the subway is great and totally not frightening at all. Just imagine how it must have been when it was way hotter. Neutral: Would You Take A Job At Faraday Future? A paycheck is a paycheck (as long as it comes one day), right?